It's pretty old news now that the grandioise, heavily Objectivist-influenced education project Founders College has gone belly up. But given that we at the ARCHNblog were on its case fairly thoroughly from the git-go, we suppose we should note its passing even if belatedly. Our sympathies of course to the students. "I attended the formal opening of Founders. Intially, the opening was I guess standard, but then it began to take on a "religious" character that raised a few flags in my mind. Then the conductor, who was also scheduled to teach music at Founders, led the orchestra in a composition which I immediately dubbed "An Ode to Tylenol Headaches" (atonal, mind-splitting rubbish). I was seated in the rear next to Gary Hull. I heard him exclaim some expletives. I wasn't far off myself in that regard. He got up and walked out of sight to have a smoke. I joined him for a smoke, for I wasn't about to sit still and be assualted by the noise. Dr.Hull in so many words wondered where Fuller found the "creep." I sympathized. So, that whole event left a very bad taste in my mouth." Why, obviously some non-Objectivist premises had mysteriously crept in to Founders...so no wonder it failed! Hilarious. Very hilarious. Please read the following accurate news stories. year for a much-heralded expansion that never materialized. Wheatley in Danville, which is serving as trustee to the transaction. course close by to the main mansion. declined comment yesterday when asked about the possibility of foreclosure. of $250,000 or 10 percent of the sale price, whichever is lower. Ed Cline: "I attended the formal opening of Founders. Intially, the opening was I guess standard, but then it began to take on a 'religious' character that raised a few flags in my mind. Then the conductor, who was also scheduled to teach music at Founders, led the orchestra in a composition which I immediately dubbed 'An Ode to Tylenol Headaches' (atonal, mind-splitting rubbish)." I remember viewing a little bit of that ceremony, including a bit of the composition referred to above (called "Vocalise"). The piece was not atonal (it is ridiculous think so), although the orchestra that played it was pretty bad a played out of tune throughout the whole piece. You have to be fairly ignorant about orchestral music not to be able to tell the difference. Yet that is one of the biggest problems with these orthodox Objectivists: that they have such strong opinions (the composer is a "creep") about matters that they are not qualified to judge. Their lack of judgment not only plays a conspicuous part in their inability to distinguish atonality from out of tune playing, but also in their inability to start and run an institution of higher learning. I guess the obvious question is. How would you have fixed founders? Wells: "I guess the obvious question is. How would you have fixed founders?" Even under the best of circumstances, starting a college is very difficult. At the very least, if you're going to have any chance at all of succeeding, you have to appeal to a fairly broad base. It can't just be to that small demographic of true-believing orthodox Objectivists. The Founders staff seemed understand this last Summer when they suddenly began insisting that they had no ties to Objectivism. However, those weren't entirely sincere objections. It was largely ARI people that set this up; and the lack of official connections to ARI missed the point, because an individual doesn't have to be officially affiliated with ARI to be recognized as part of the ARI community. And it's the community that's the problem. Orthodox Objectivists have been isolating themselves from the rest of society on one pretext or another since the fifties. 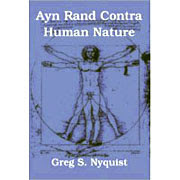 First, Ayn Rand broke with conservatives, then she quarrelled with libertarians, she split with her the number 2 guy in her movement; and then Peikoff upheld this tradition by denouncing and breaking with the smartest guy in the movement, David Kelley, and then purging most of the best minds attracted to Objectivist ideas. Orthodox Objectivists can't get along with anybody, even with the people with share many of their ideas, like the TOC people and libertarian-minded conservatives. In the Founders debacle, they are merely reaping what they have sown. To accomplish anything as ambitious as Founders, you need to be able to league with like-minded people. That means leaguing with people you don't entirely agree with, with neo-Objectivists, libertarians, conservatives. But instead, orthodox Objectivists use every opportunity to pick quarrels with these groups and pretend that any association with them is "evil." Rachmaninoff's "Vocalise," op. 34, no. 14, which Rachmaninoff transcribed for orchestra? Pretty funny if the poor conductor were playing some Rach just to please the droids, and a. the orchestra played completely out of tune, and b. the droids couldn't tell Rach from a hole in the ground. The idiocy would be delicious.